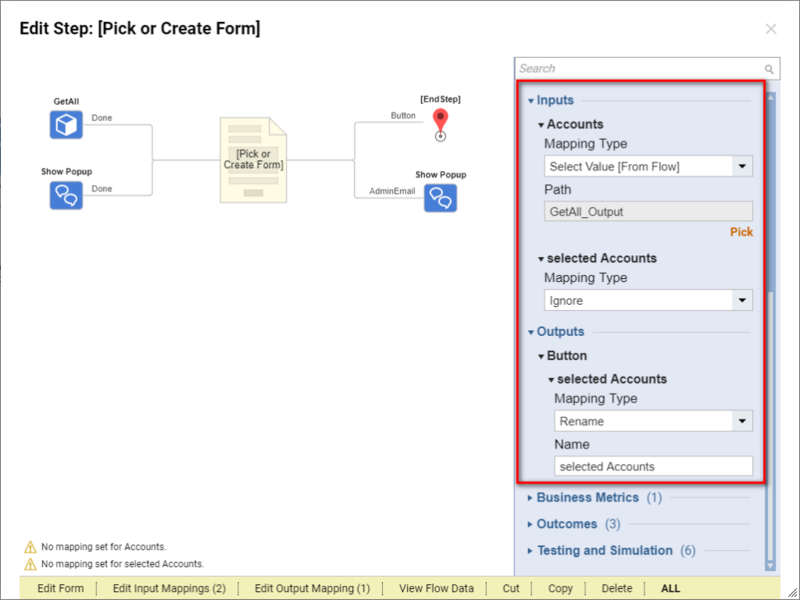 A form displays controls that allow a user to perform an action, such as enter data, display a report or folder, or manage entities. You can create a flow that, when run, opens a form. 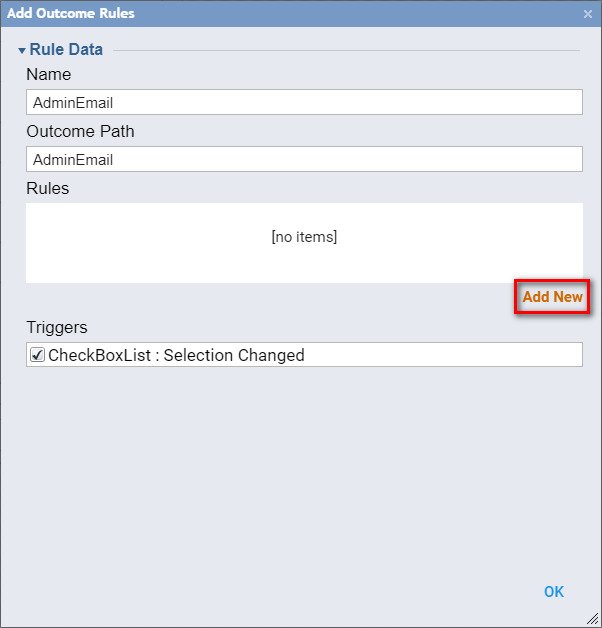 It is possible to create a custom Rule	that can be used to control Form’s Outcome	behavior. 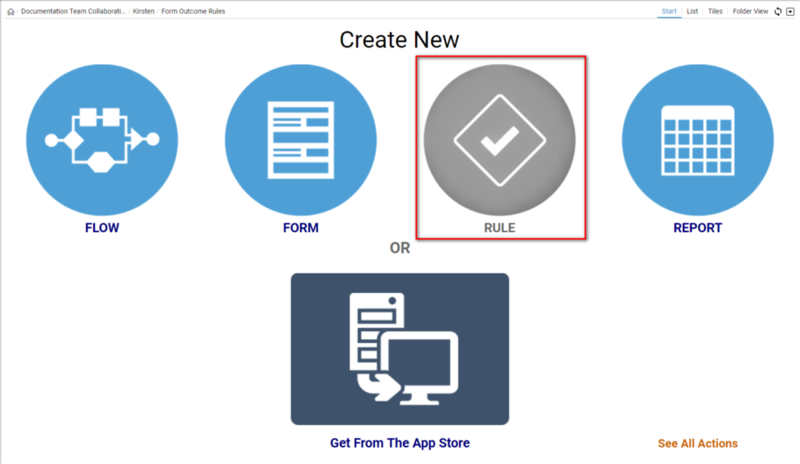 In this example we will create a Rule	that will be used to control our Form’s	behavior. 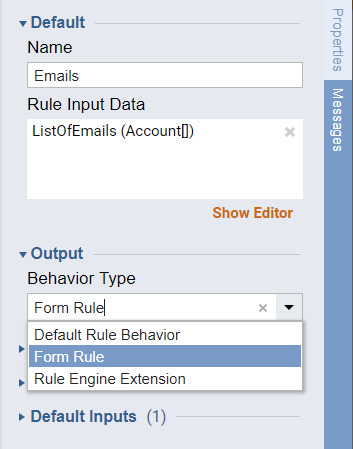 Our Rule	will create a condition to show Notification	when user selects Admin	email from the list of emails on the Form . We begin in the Designer Folder with clicking Create Rule > Create Rule	on theFolder Actions panel. 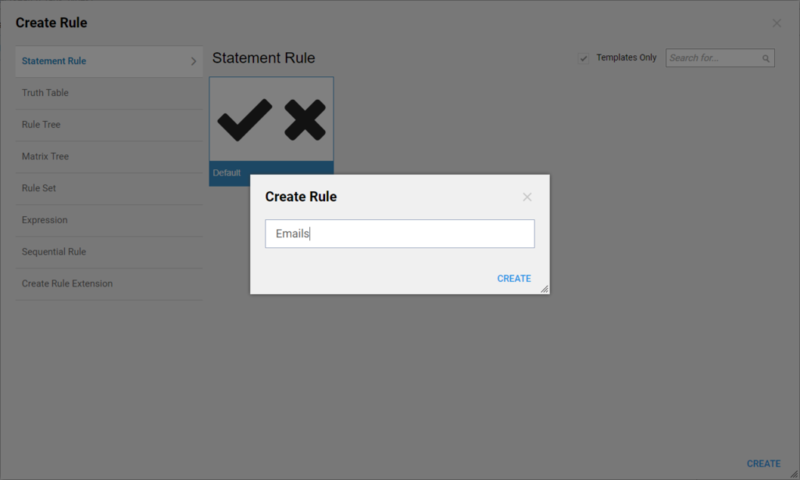 Next, we name the Rule and click Create	to proceed to the Rule Designer. 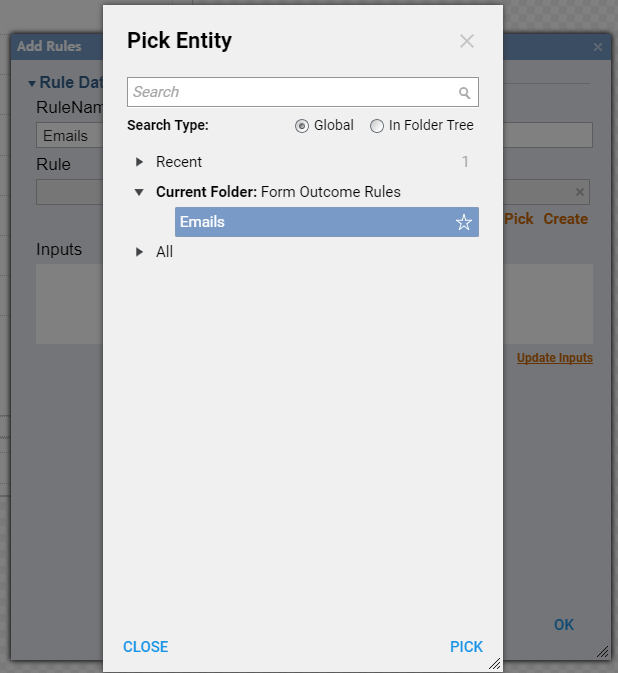 In the Rule Designer we clickShow Editor	link to add new Rule Input Data. 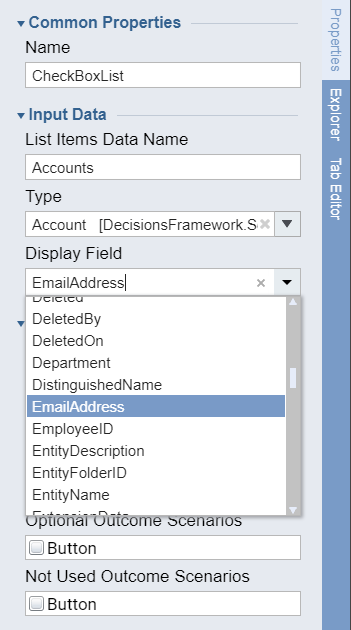 In the Data Definitions	dialog, we Name	our input, select its Type as Account	and check Is List	check-box. Then, we can click Ok	to save and close this pop-up window. 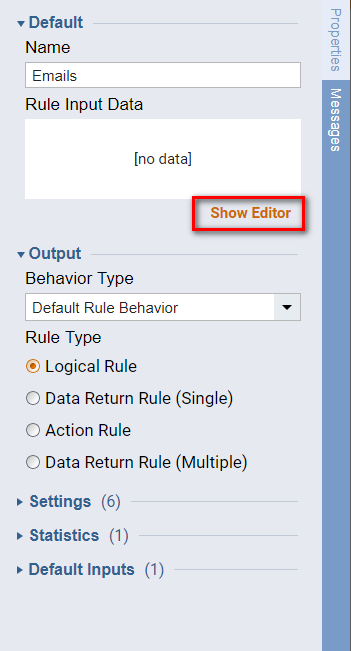 Back in the Rule Designer Properties	panel, in the Output	section we change the Behavior Type	to Form Rules. 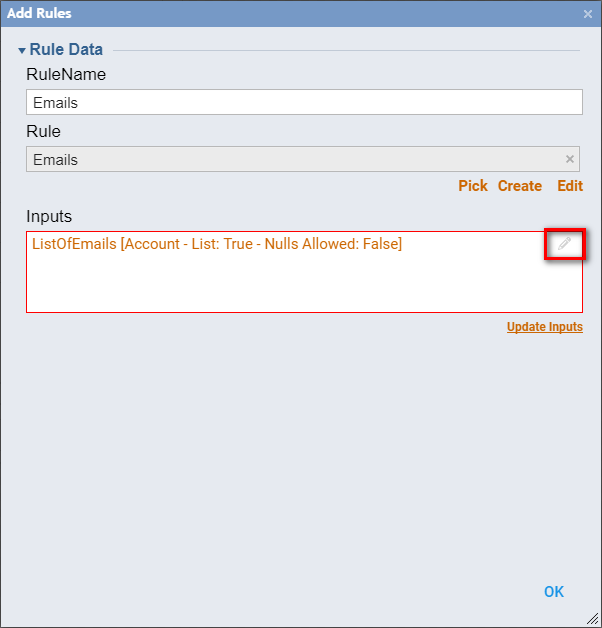 First, we expand our Rule Input data and select List Of Emails. Click Next	to continue. 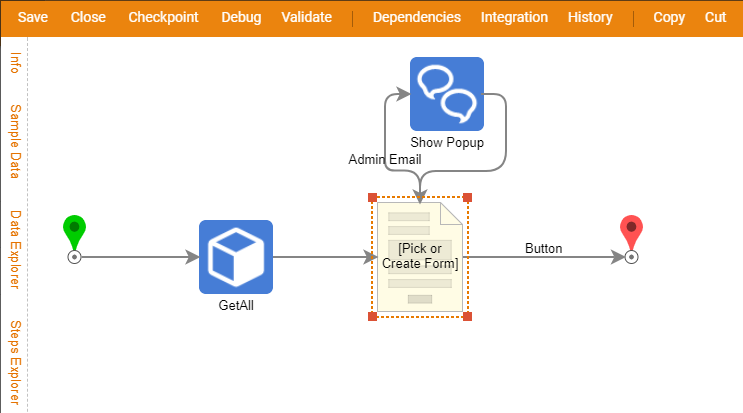 Finally, we define the Input as, Constant	and the value as,admin@decisions.com	for the List of Emails . Click Done	to complete this Rule Phrase . Click Close	in the top panel to save and close the Rule Designer . Back in the Designer Folder we click Create Flow	button to create a new Flow	. We name the Flow and click Create	to proceed to the Flow Designer. 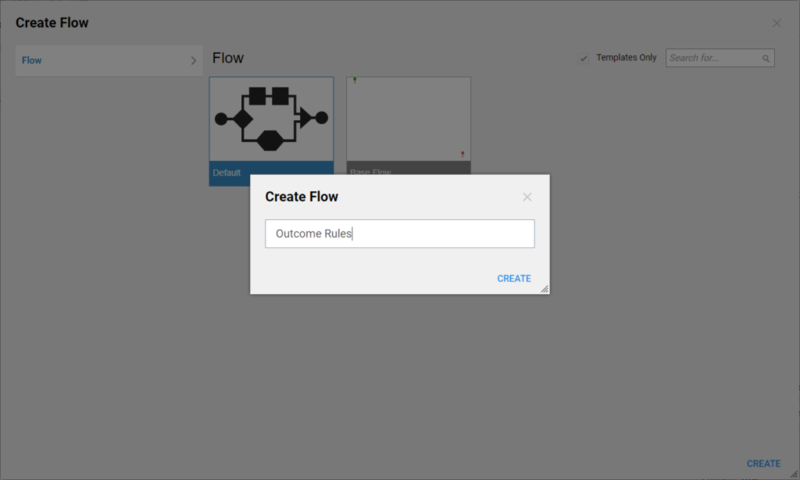 Next, we expand Flows, Rules, Forms and Reports > Forms [Interaction]	category and add [Pick or Create Form]	step to our Flow . 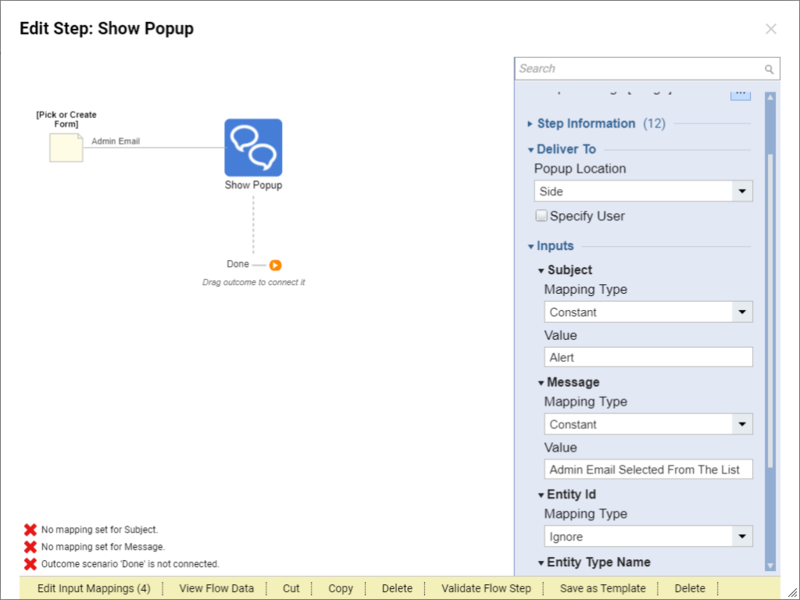 In the resulting pop-up window we click Pick or Create Form	link. Then, in the Create New	field, we name the Form and click Create	to proceed to the Form Designer. In the Form Designer we add Button	control from Actions	category in the ToolBox	. 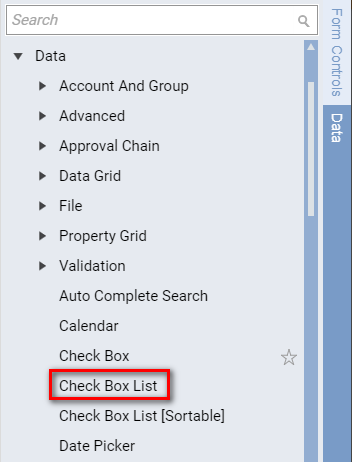 Next, we add Check Box List	component from the List	category in the ToolBox. Then, we need to configure this Check Box List	component. First, we define List Items Data Name	. 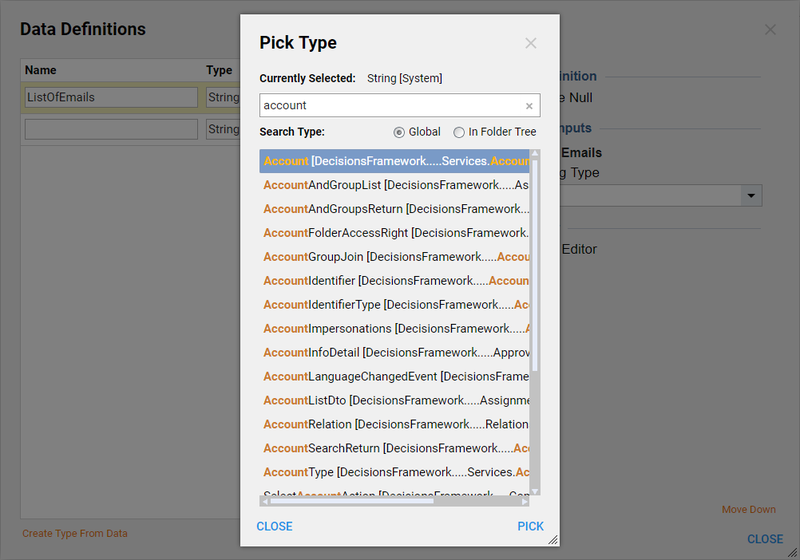 We useType Picker	to select Account Type	for this list. 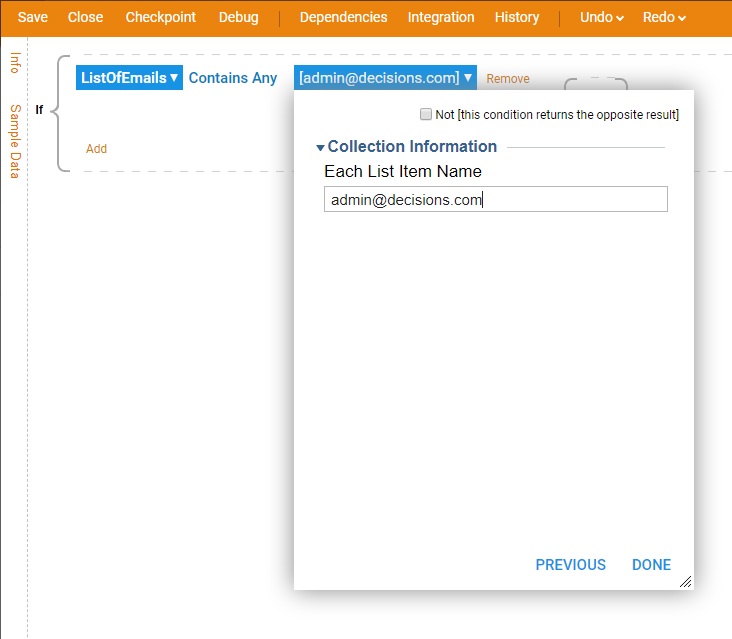 Next, define Selected Item Data Name	, and use our Button	control as an Optional Outcome	for this list. 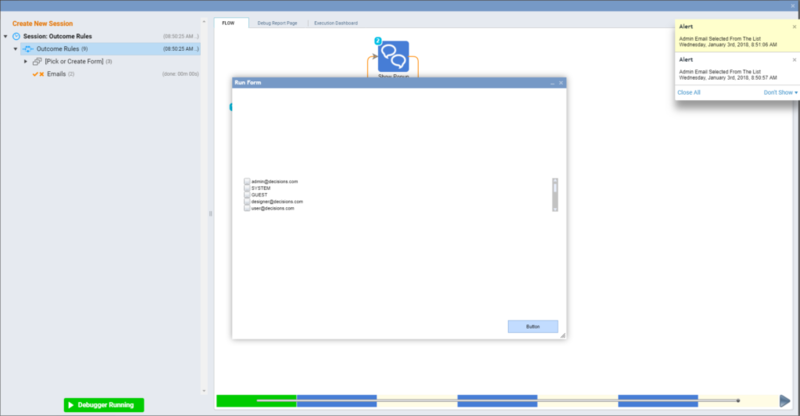 To navigate to the Form’s properties we select Explorer	on the right panel. 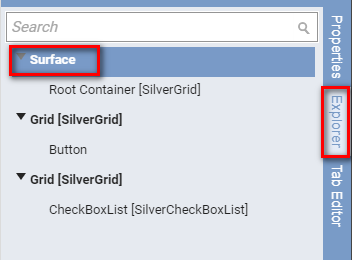 In the Explorer we select Surface	component and click Properties	. In the Surface Properties we locate Outcome Rules	configuration and click Add New	link. 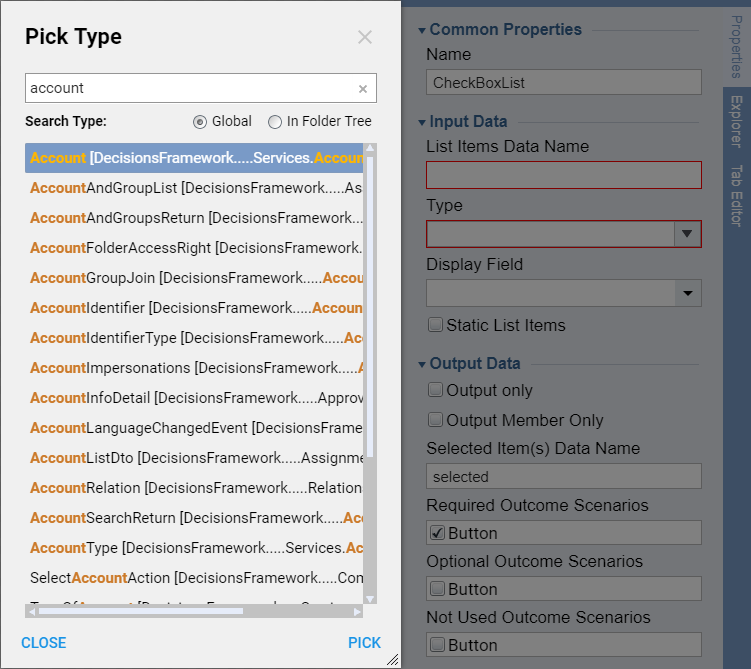 In the resulting pop-up window we define Name, Outcome Path, and Triggers	for our Rule and click Add New	link to configure Rule Data. 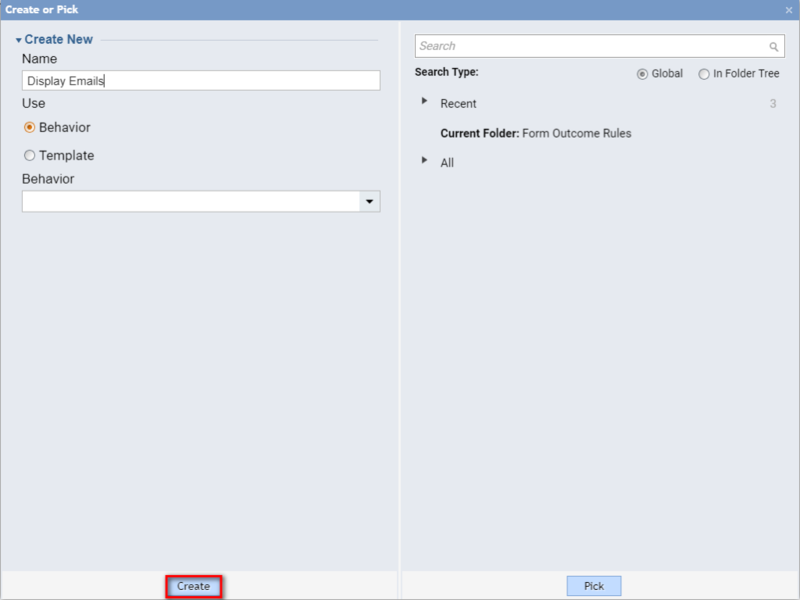 In the Add Rules window we provide RuleName	and use Rule Picker	to select the Rule that we have created previously in this tutorial. After we picked the Rule we need to configure Inputs	to this Rule. Click Update	Inputs	then click the pencil icon to edit the Inputs	. 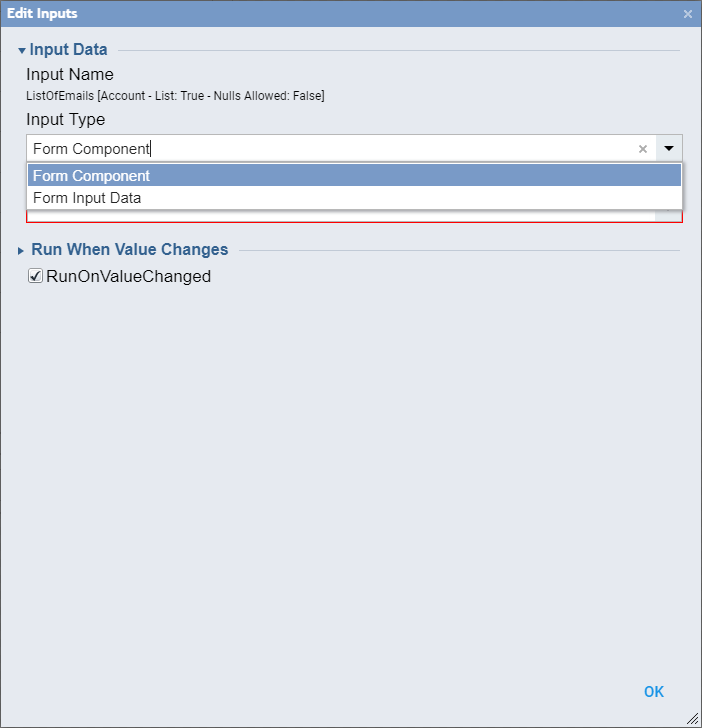 In the Edit Inputs	dialog we select Form Component	option from the Input Type	drop-down list. Next, from FormDataName	drop-down list we select Selected Accounts	which is a data name for the user’s selection from the list of Emails . Then, we can save and close all dialog windows for Outcome Rule configuration. This completes our Form . We can save and close Form Designer to return back to the Flow Designer . 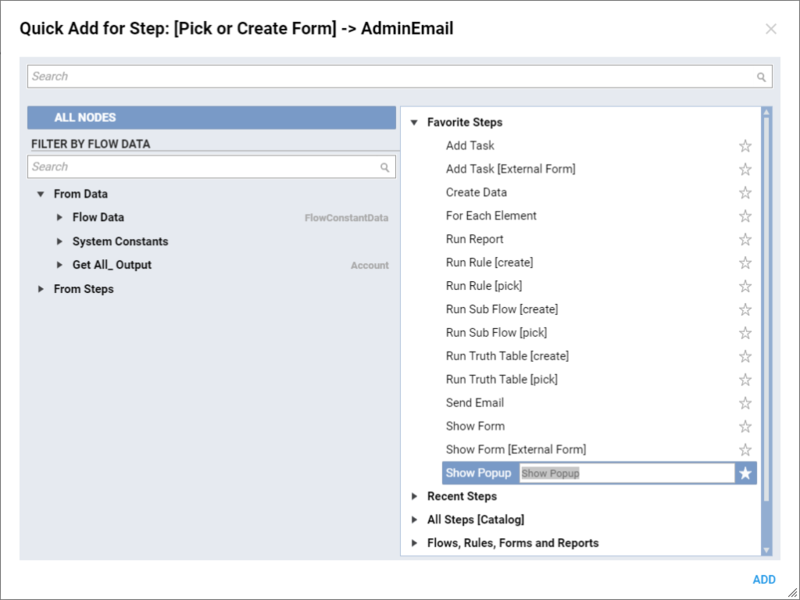 In the Flow Designer, we add Show Popup	step from the Favorite Steps	category in the Quick Add Step	dialog to the AdminEmail	outcome from our Form . This outcome from our Form was created with Outcome Rule. In this case we want to show a Notification to the user when theOutcome Rule evaluates True (in other words, when user selects Admin email). 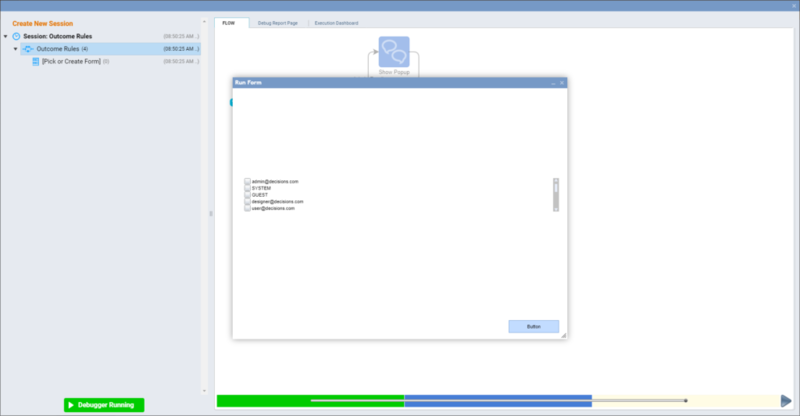 In the resulting window we configure Subject	and Message	for our Show Popup	step. 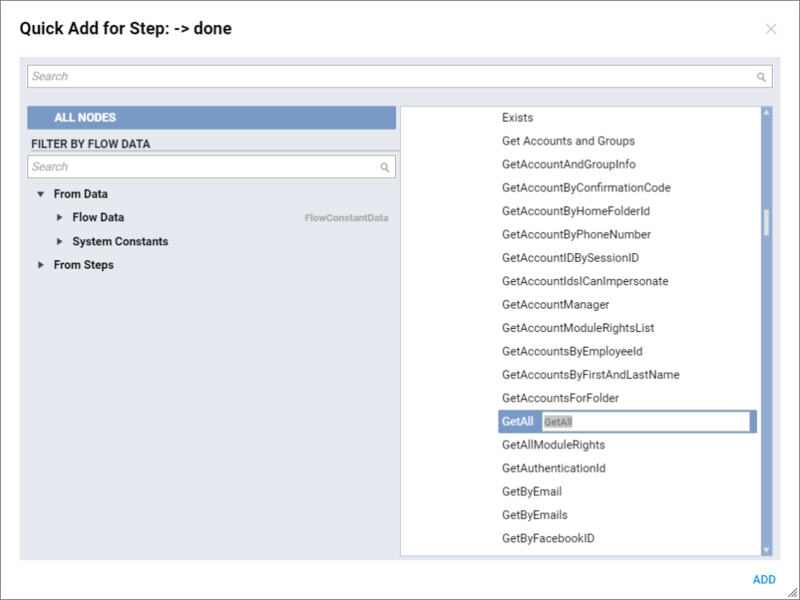 Next, we select Edit Input Mappings	from Form step options in our Flow . 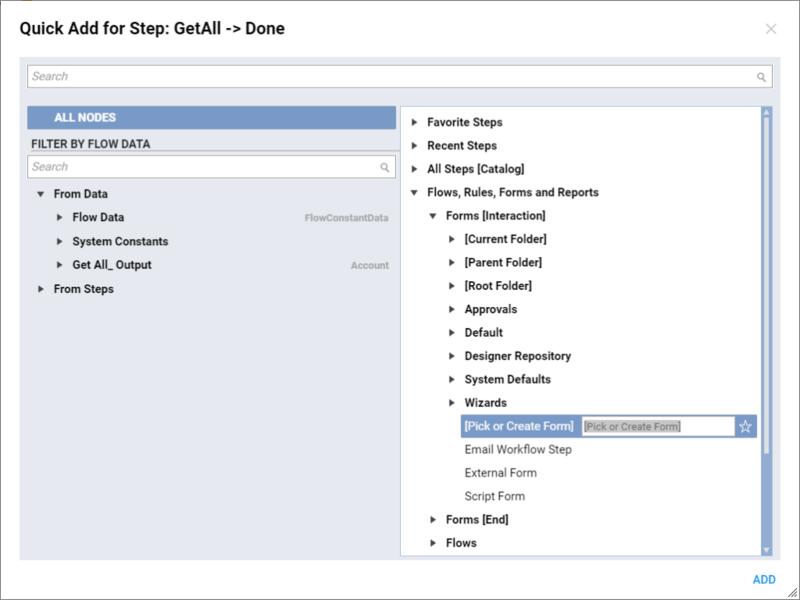 In the Edit Step	dialog under Inputs > Accounts	we click the Select Value [Form Flow]	and choose GetAll_Output	to populate the Check List in our Form with all Accounts in the system. Set the Selected Accounts	to Ignore	. We can save and close Mapping Editor	when finished. This completes our Flow . 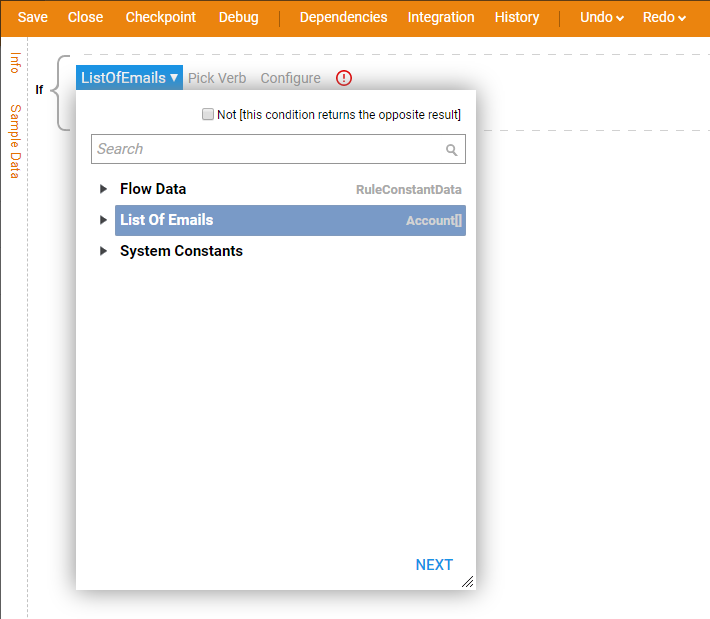 We can clickDebug	link from the top panel in the Flow Designer to test our Flow . 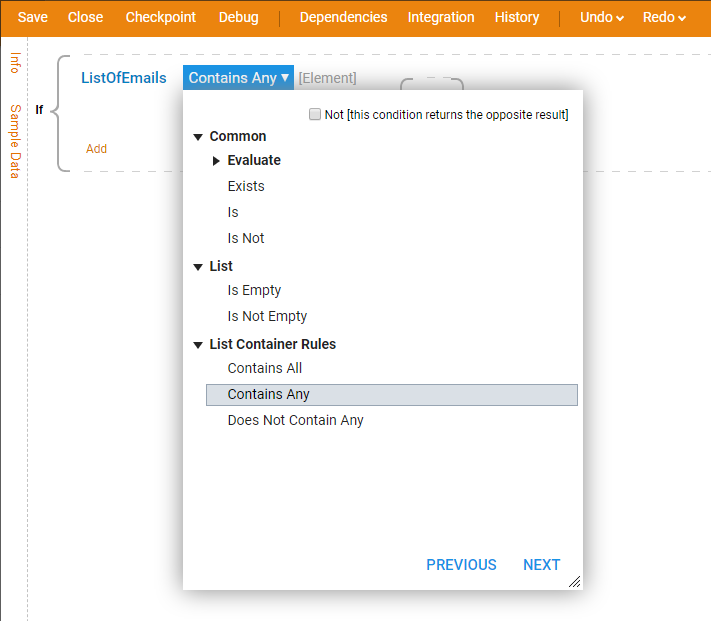 Our Form opens in the Debugger	and the Check Box List	is populated with all Accounts . We can select several Accounts from this List. When we select admin@decisions.com	email from this List we trigger ourOutcome Rule	. As expected, Notification	pops up and our Form resets.